Tabeaud Reservoir (2 miles) Take East Clinton to right on Tabeaud Road. Nice little nearby lake ideal for hiking and bike/horse riding with an easy 2 mile loop around the lake. Rarely crowded and dogs usually seen swimming and off leash here (though leash signs). Mokelumne River access off Electra Road (13 miles). Nearby river well known for kayaking. Day Use Area 2.8 miles east of Hwy 49 with parking, picnic facilities, bathrooms, beach and rope swings into slow pool in river. Middle-Fork Cosumnes Campground (33 miles), Hwy 88 to Cat Creek Rd just past Ham Station. Follow signs to campground for 8 miles. Great swimming hole and slide rock under Cosumnes River bridge. Hiking trails along creek-sized river and campground. Bear River Reservoir (37 miles). High altitude campground open all year. Kirkwood Meadows (50 miles) Not just for winters, Kirkwood offers many fantastic summer sports including bike park, climbing wall, chair lift, zip lining, disc golf, and of course miles of alpine hiking trails. Dogs often seen off leash. Jackson Family Sports for bike rentals (9 miles). Organized group rides during the summer. 209-223-3890. Lake Camanche (27 miles). Marinas on both shores with ramps, rentals, gas. Swimming off sandy beaches. Waterskiing -- bring your own boat. Trout, catfish, sunfish, & bass. North Shore off 88 near Ione. New Melones Lake (43 miles) Full service marina. Variety of water rentals including ski boats and wake boards. South of Angels Camp. Shealor Lakes (44 miles) Trailhead with parking marked on the west side of Hwy 88 across from Silver Lake. Fairly easy 3.2 mile round-trip hike to pretty mountain lake. This is one of our favorite 1/2 day excursions and we’ve not had problems with crowds nor letting our dogs off-leash (see the photo). Carson Pass / Hwy 88 hikes (45-55 miles near Kirkwood). There are many great day hikes of various lengths and intensities to beautiful destinations: Silver Lake, Caples Lake, Emigrant Lake, Woods Lake, Blue Lakes, Round Top Lake, Winnemucca Lake, Granite Lake, 4th of July Lake, Thunder Mountain, and along the Pacific Crest Trail. 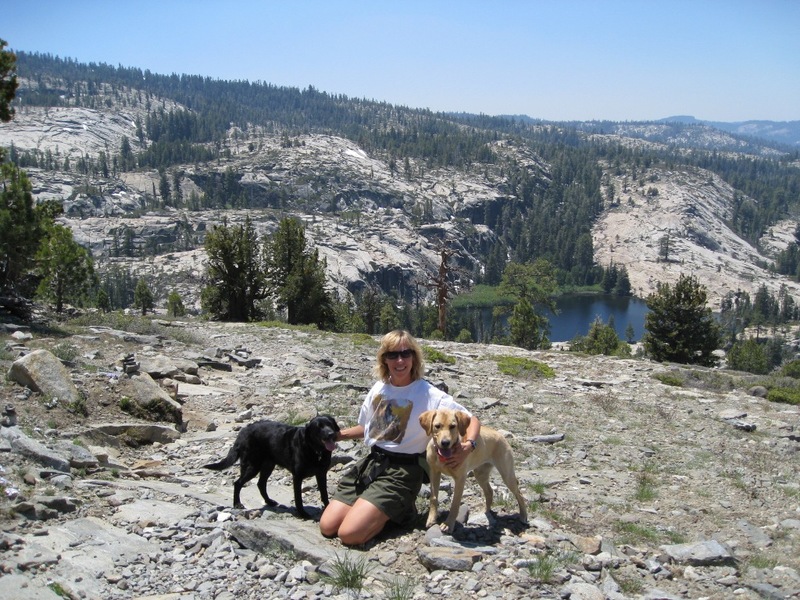 Most are off-leash since National Forest (supposed to be on-leash in wilderness area) with the link to the Carson Pass describing hikes and trailheads. Cave & Mine Adventures: If you haven’t tried caves, they’re cool -- literally! California Cavern (36 miles). 50-80 minute family tours or wild cavern expedition trips. East of San Andreas in Calaveras County. Moaning Cavern (43 miles). Descend via stairs or 180-ft rope rappel. Adventure tours and twin zip line rides also available. East of Angels Camp. Laughton Ranch (10 miles) Ride the rolling hills of a large horse ranch in the heart of Jackson. Kirkwood Sierra Outfitters (45 miles) High country trail rides around Silver Lake during summer. Boarding on the Lake (49 miles) Horseback riding on beautiful Folsom Lake including highly-rated rental string trail rides. Quartz Mountain Stage Line (50 miles) Authentic stagecoach rides in Columbia. Ride shotgun or inside the coach. Snowboarding and skiing at Kirkwood (1 hr on Hwy 88) or other South Lake Tahoe resorts such as Heavenly and Sierra at Tahoe. Dogs love the open meadows behind the condos and the cross country trails! Snow play in the Sierras (30-60 minutes up Hwy 88, depending on the snow elevation). Bear River Reservoir is often a great location to pull off the highway and let the pups enjoy the snow. There are also 4 nearby California SNO-PARKS that are ideal for people and their pets enjoying the snow. White Water Rafting: May - September is the best time to enjoy. Many rafting companies offer 1/2 day or longer trips on the American River South Fork about an hour away. None that we’ve found allow dogs though. Hunting/Shooting throughout the Sierras with proper tags and seasons.